The Jousting Life: The First Joust in Tasmania Held During the "Burnie-Wynyard Medieval Festival"
The First Joust in Tasmania Held During the "Burnie-Wynyard Medieval Festival"
The first ever Burnie-Wynyard Medieval Festival, was held the weekend of the 15th and 16th of September. 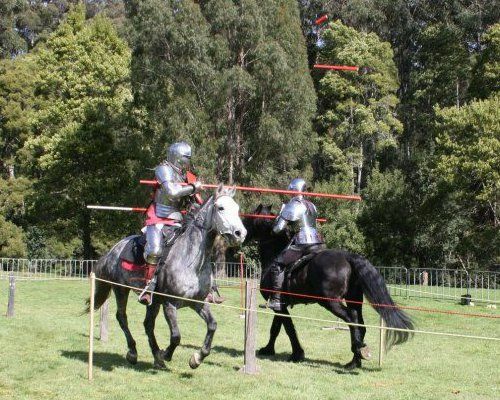 It included a mounted skill at arms(MSA) display, a melee and a joust by Australian jousters, Justin Holland, Wayne Riggs and Phillip Leitch. 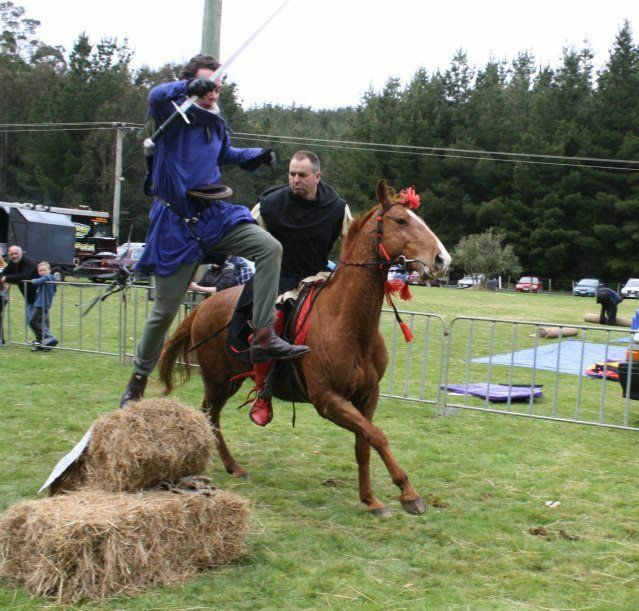 This was the first joust to be held in Phillip's home state of Tasmania, and it was very well received by the locals. 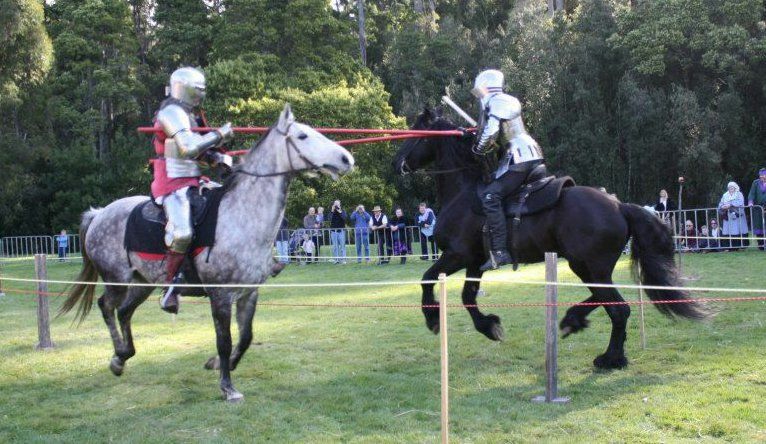 Two of the horses used in the event had never jousted in a public display before and stepped up to the task, as if they were seasoned veterans. Phillip's Friesian Stallion 'Valiant' stole the show with his impressive physique and presence. 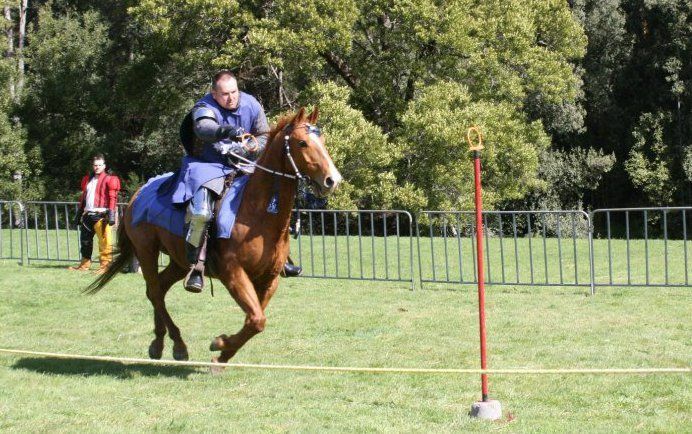 Phillip's wife Lisa was kind enough to lend the jousters her Australian Stock Horse 'Bounty', who had done the least joust training of the three, but he was ridden well by seasoned jouster Justin Holland, and performed brilliantly throughout the weekend. The third horse 'Hood', owned by Wayne Riggs was shipped over by ferry especially for the tournament and put on a great display of speed and skill, truly a credit to his owner and rider. Wayne, when asked about his horse's breeding will tell you he is a "Mongrel", but whatever his breed, he was definitely worth the effort and expense to bring into the state. The joust was broken up with pieces of improvised theatrics where the evil "Sir Riggsy" would, chastise, beat and boss "Sir Phillip's" squire "Sam" around, and chase him down the lyst. 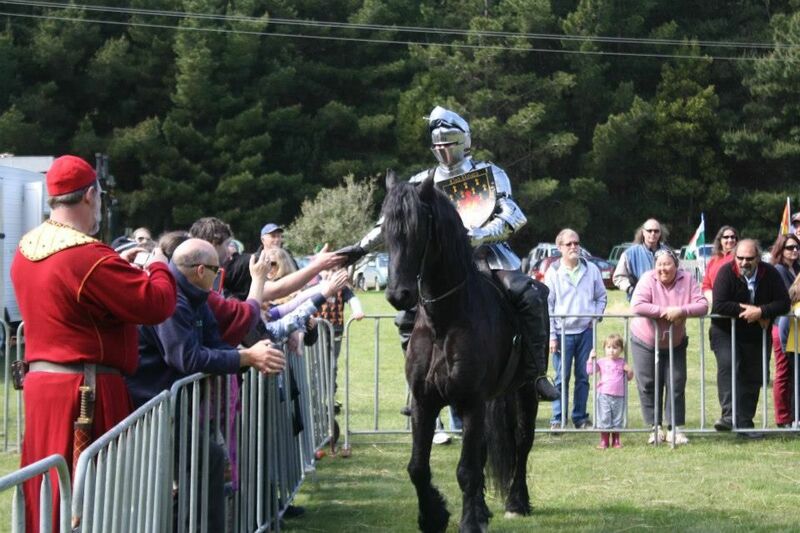 Occasionally "Sir Phillip" would intervene, pursuing the evil knight or challenging him to further joust passes. The comedic performance of "Squire Sam" is something that the audience will surely remember for a long time. Over the weekend three joust displays were run and judged separately. Amazingly, each of the jousters won one of the displays! A very close competition indeed. 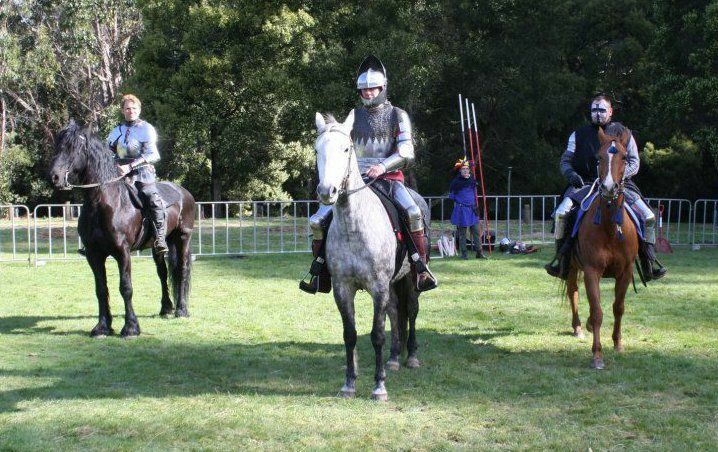 It is hoped that the weekend will turn into an annual event, growing in size and involving more jousters in the future. Even so, for a small place like Tasmania, it was a great event that the organizers should be very proud of. Many thanks to Phillip Leitch and Lisa Leitch for providing the text and pictures for this article. My family & I had a chance to get up there on the Sunday & thought it was a great show! We'd never seen jousting in real life before, but my family loves a Knights Tale so it was awesome to see it and well worth the drive from Dunalley! Oh, and the kids liked the blue squires antics too.